Although many readers find themselves giggling aloud as they read Anne Fine’s writing, her books can be deceptively weighty. “A lot of my work, even for fairly young readers, raises quite serious social issues,” she admits. “Growing up is a long and confusing business. I try to show that the battle through the chaos is worthwhile and can, at times, be seen as very funny.” In 1994, audiences around the world had the opportunity to experience this unique combination of humor and realism in the hit movie Mrs. Doubtfire, inspired by Anne Fine’s Madame Doubtfire and starring comedic genius Robin Williams. Anne Fine lives in England with her two daughters and a “huge hairy dog.” She is the author of more than fifty books for children and adults, and her work has been translated into twenty-five different languages. 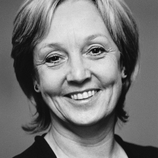 Twice chosen as Children’s Author of the Year in the British Book Awards, Anne Fine was named British Children’s Laureate for 2002.